Getting engaged is where it all begins, the promise of love and forever. It is an exciting step one remembers as much as its confirmation on their Big Day. The moment when your loved one proposes to you becomes a cherished memory you carry in your heart and share with others with a smile on your face. Photography can turn this special moment into a lasting memory. 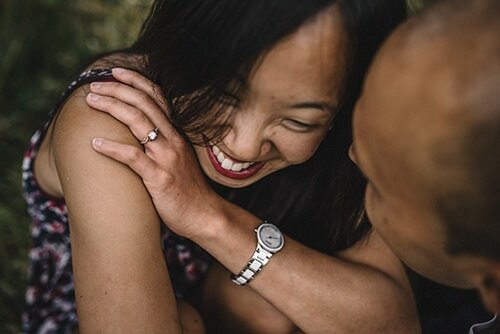 Engagement photo shoot is a great opportunity for you to see how your photographer works and for me as a photographer it is a chance to get to know you both as individuals and a couple. Spending this time together will give us a chance to discuss the ways in which we can work best and find out what style, poses and mood work for you. It is important that you feel comfortable in front of the camera as this does show in the pictures, especially if you don't generally enjoy being photographed. Having this experience will help you to feel more relaxed and at ease on the day of your wedding. During the session we can talk over any worries or preferences you might have. Besides, it is fun and part of your wedding package, so you are not paying anything extra. So why not enjoy a romantic photo shoot in the company of your loved one at a location where you both feel comfortable. 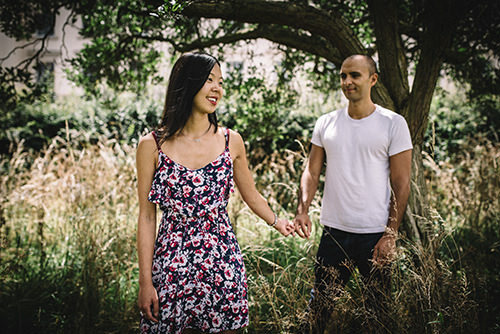 Most of the engagement sessions take place in Cambridge (Cambridgeshire) or around. Quirky little streets in the historic college city of Cambridge provides a fantastic backdrop for any photography. For the nature lovers there are plenty spots to choose from too. To see some example of engagement photography, check out the engagement gallery page.